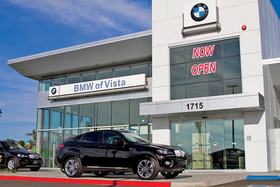 BMW of Vista in Vista, Calif., is participating in BMW's new pooling system. Ted Hitchcock, dealership general manager, says the project has great potential. BMW will test a distribution system in San Diego that calls for holding vehicles allocated to multiple dealerships in a single location and absorbing the storage costs until a store matches a car to a buyer. If it works, the plan, which could produce big floorplanning savings for dealerships, could be expanded to include other regions and models. "It has the potential of cutting your flooring bill in half," said Jeff Gerken, general manager of BMW of South County in El Cajon, Calif.
Next month BMW will begin stockpiling 50 3-series sedans in a central pool for five San Diego-area stores. That's equal to 20 percent of the dealers' combined 3-series sedan allocation for February. "This is an experiment to see if we can utilize stock better by keeping it centrally and ordering it centrally," said Jim O'Donnell, CEO of BMW of North America. "We say we can do this quicker. We can get cars to the dealer and the consumer quicker and we can cut down on the amount of stock." BMW eventually plans to increase the number of cars added to the pool to 30 or 40 percent of a full month's allocation. The test will run until October or November. Dealers can continue to order and sell cars that aren't in the pool. The pool vehicles can be taken only if a dealer has sold a specific car to a customer or trades one with another dealer. O'Donnell said dealers will have access to more stock than normal and will be better able to find the vehicle a customer wants. And with BMW holding the cars in one place, the number of costly swaps with other dealers will be reduced. "I am doing it as an experiment because I think we can make the theory work," he said. "It saves the dealers money, it saves us money, and it saves complexity." O'Donnell declined to speculate on the potential savings. The San Diego pool cars were configured using a computer algorithm based on what sells in that market, said Rich Brekus, BMW of North America's general manager of new-car sales. BMW chose 328i and 335i sedans for the program because they are among the oldest models in the brand's lineup; BMW's newer models are more frequently ordered to customer specifications. At least 70 percent of sales of the new X5 are built to order. The average for the brand is 30 to 35 percent, while 20 to 25 percent of 3-series models are built to order. A new generation of the 3 series, BMW's highest-volume car, is due in 2012. BMW says the program has other potential advantages. For example, the pool has more colors and options than a single dealer can stock. Also, the need to expand showrooms as BMW extends its range with smaller cars and electric vehicles may be reduced. Brekus said BMW chose the San Diego dealers because a high proportion of customers in the area buy from dealer stock. California dealers also trade more cars with other dealers than elsewhere in the country. Nationally, 20 percent of all BMWs sold have been swapped between dealers. In California, 25 percent are swapped -- 10 percent before the dealer actually has the car and 15 percent afterward, Brekus said. The cost of swapping cars can cut deeply into dealer margins. He says the transport costs can range from $500 to $800 if the other dealer is more than about 50 miles away. Dealers not only have to arrange and pay the transportation cost for those trades, "there's the man-hours, locating a car, calling other dealers, waiting for a call-back and initiating the trade," said Ted Hitchcock, general manager of BMW of Vista, in Vista, Calif., which is participating in the program. Hitchcock said the allocation project has great potential. "We just started," he said, "but the five dealers are working well together."